A capital idea for Summer Fun: the Smithsonian invites Basque-Americans to participate in its 2016 Folklife Festival. We hope to see you there! On December 19, 2015, the New England Basque Club welcomed winter by celebrating Santo Tomás in Middletown, Rhode Island. Club members gathered for a delicious potluck meal, showcasing members’ culinary talents. They also enjoyed music, camaraderie, a raffle and of course, some rounds of mus on a crisp Saturday in the Ocean State. The pinnacle of the festivities came when Olentzero stopped by, visiting and taking photos with the Club. What a fantastic and fun close to 2015! The New England Basque Club thanks all Club members for another wonderful year; Eskerrik asko denori! We look forward to seeing you all in 2016 for more excellent events as we continue to foster and promote Basque culture and tradition in New England! Eguberri eta urte berri on! Check out the NEBC Facebook page to see some photos. 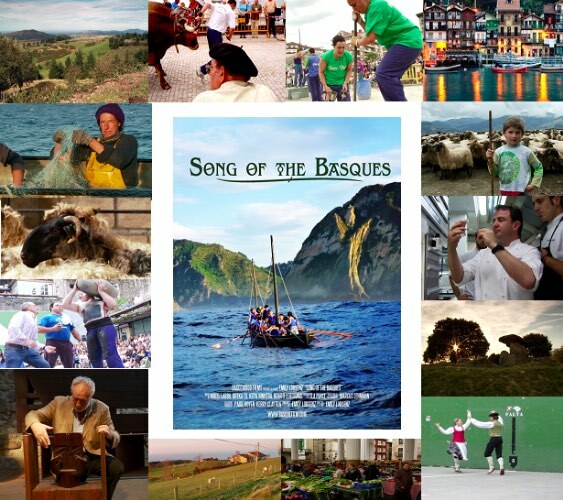 Join the New England Basque Club at a screening of “Song of the Basques” for an evening of film, cider-tasting, and pintxos! There will also be a “Q&A” with Director Emily Lobsenz. Mark your calendars for our Santo Tomás Christmas Celebration to be held on Saturday, December 19th, in Middletown (RI). When: December 19th, 4pm to 9pm. There will be a raffle with Spanish products, Basque Christmas Carol singing and a Mus Tournament following the dinner. The little ones will have the opportunity to tell Olentzero their present requests and do some Holiday themed arts & crafts. 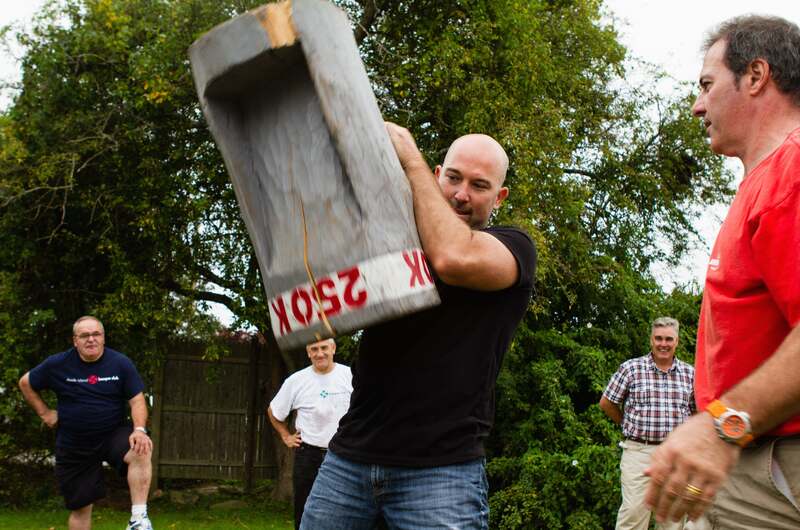 Middletown, Rhode Island – On Saturday, October 24, 2015, the New England Basque Club gathered for Sagardo Eguna (Cider Day). Along with hand-pressing and savoring cider from fresh-picked apples, the crowd enjoyed sporting events, food and drink, history, literature, trivia and a raffle. The guest of honor was Begoña Echeverría, a Basque-Californian author from Chino, who presented her novel “The Hammer of Witches,” on the Basque witch trials held during the Inquisition. After sampling some txistorra, the festivities began outdoors with some spirited competition in herri kirolak, including aizkolaritza, harri jasotzea and txingaruten. Also on full display was the lovely New England autumn with its crisp air and trees ablaze in orange, red and gold. Inside awaited more txistorra and a meal of chicken, salad and desserts. The raffle boasted five winners, each of whom took home some delicious Basque cider generously supplied by our friends at Vermont’s own Shacksbury Cider. Eskerrik asko! Begoña Echeverria gave a highly informative and entertaining presentation on witch-trials in the Basque Country, tied to her historical novel “The Hammer of Witches.” Listeners also got an edge in the trivia contest to win a copy. Begoña signed books as well. The New England Basque Club would like to thank Begoña again for her visit; we were most glad to have her and wholly appreciated the illuminating talk! 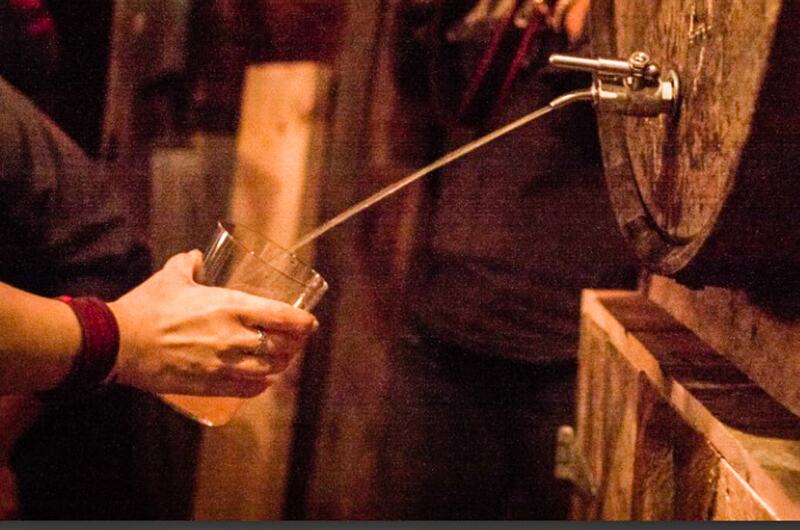 Throughout the event was the opportunity for greenhorns and old salts alike to try their hands at pressing cider. 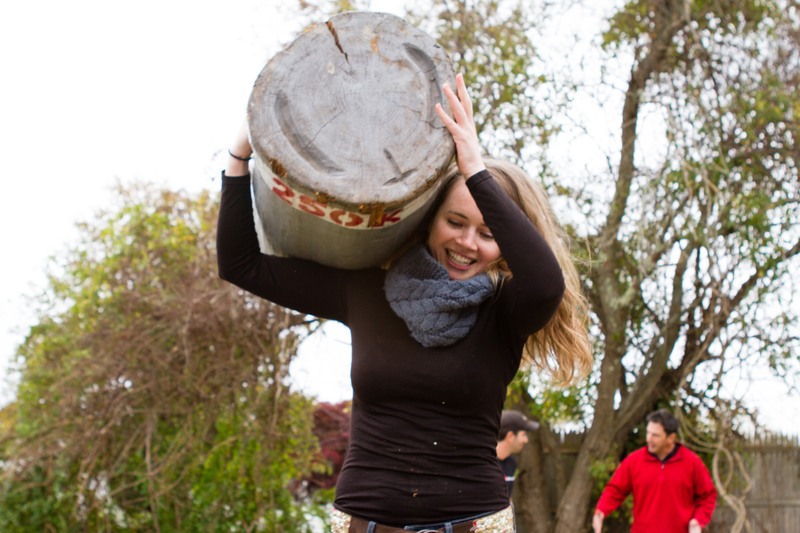 The group made short work of it, transforming barrels of apples into gallons galore. The New England Basque Club thanks everyone for helping make this year’s Sagardo Eguna a success! Check out the NEBC Facebook page for more photos. All New England Basque Club members and friends are invited to participate in our Sagardo Eguna on Saturday October 24th at Knights of Columbus in Middletown, Rhode Island. The celebration will start with an exhibition of Basque rural sports, including aizkolaris (wood-chopping), sokatira (tug of war), txingaruten (weight carrying) and harrijasoketa (weight lifting). Afterwards, we’ll have a Cider Making demonstration and “txistorra” sandwiches. The Californian Basque writer Begoña Echeverria will be our very special guest that day. Echeverria will read an excerpt from her book “The Hammer of Witches,” a historical novel about the Basque witch trials of the 17th century, and sign copies. During the celebration, we’ll be raffling some authentic Basque Cider from Astigarraga sent over by the folks at Shacksbury, in Vermont. A contribution of $10 per person will be collected to help sustain the activities of the NEBC. RSVP before October 17th to nebasque@gmail.com if you plan on attending. 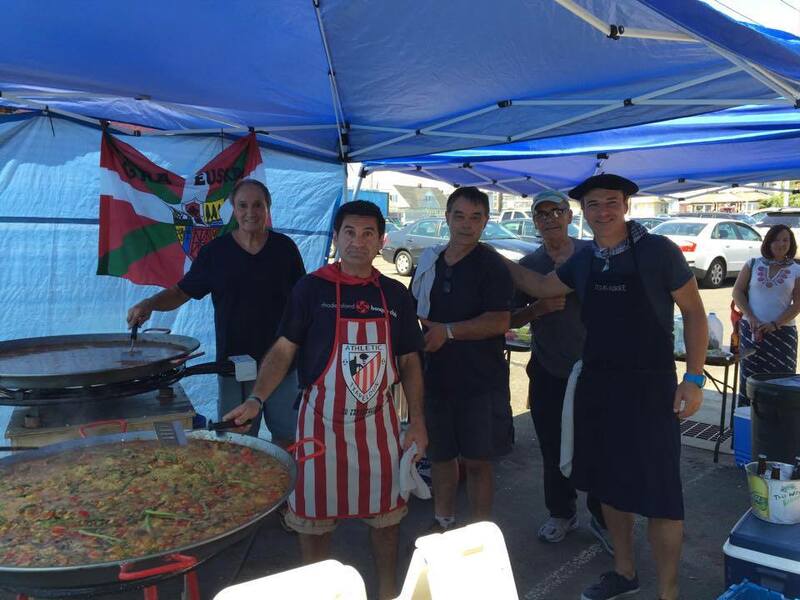 On August 15, 2015, the New England Basque Club gathered for Mariñel Eguna at the Dolphin’s Cove Marina in Bridgeport, Connecticut. 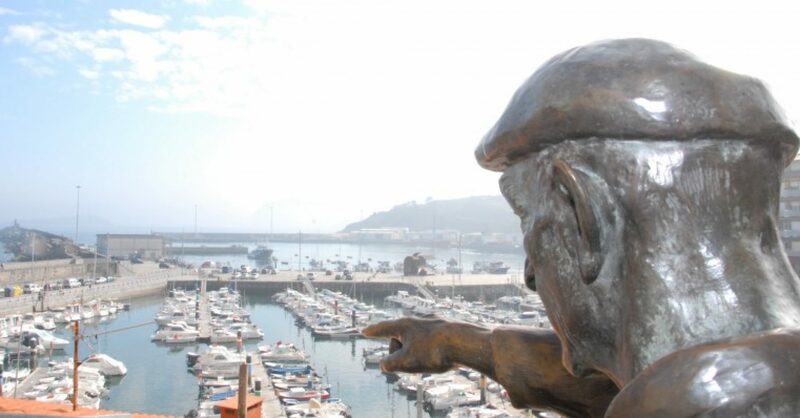 This celebration of the Basque fishing tradition, deftly organized again by Naiara Azpiri, saw peak numbers of attendees (most decked out in traditional navy blue! ), including members of Euskaldunak Quebec, Montreal’s Basque society. With two delicious kinds of paella prepared by the New England Basque Club, along with appetizers, deserts and beverages provided by the restaurant, the occasion proved a sybarite’s paradise. There was also Basque music, a raffle and a lively rendition of “Boga, Boga,” sung in chorus. Even the weather channeled the holiday’s spirit, treating us to the sea breeze, silver sky, and misting so evocative of Euskal Herria. This year’s Mariñel Eguna was a wonderful chance to gather together as well as a fine curtain call for the New England Basque Club’s summer celebrations. 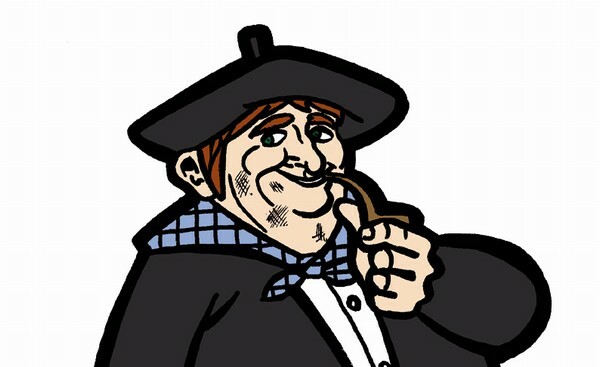 Eskerrik asko denori eta ongi izan! 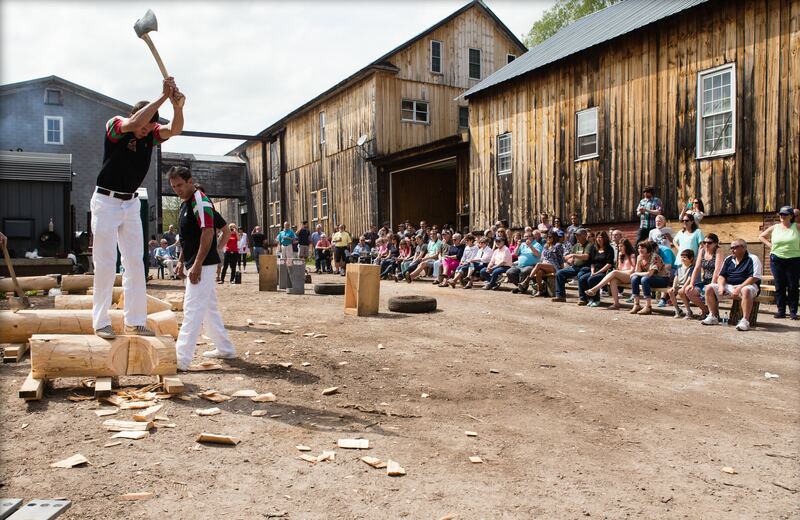 On May 9, 2015, the New England Basque Club celebrated Txitxiburduntzi at Riki Lasa’s farm in Connecticut. Lovely weather held out for the whole celebration, which included herri kirolak, a delicious supper with a roast pig masterfully prepared by Patxi Gandiaga, as well as music and a raffle for top-class Gipuzkoa cider provided by Shacksbury of Vermont. The Club was also pleased to host the 52-time world champion in timber sports, Mike Sullivan, as a participant in this year’s aizkolaritza competition. Sullivan enjoyed the Basque take on the sport for its mix of speed and endurance, individual skill and teamwork. These were the elements that first drew the Colebrook, CT native to wood-chopping. After seeing a contest on ABC’s Wide World of Sports, and with the guidance of fellow sportsman Jim Colbert, Sullivan began the journey that took him – a former professional baseball player, a pitcher drafted in the first round by the Cincinnati Reds – to New Zealand to train. Now, Sullivan still loves competing in front of an engaged audience. One that appreciates the tactics and chess match nature of the sport, the need to think three cuts ahead, to strategize each chop, to stay meticulous and fast both for one’s own sake and the team’s. This is the delight of participating in the Txitxiburduntzi aizkolaritza, in front of spectators culturally steeped in this art and tradition. The Club thanks Mike and the other aizkolariak for their wonderful show of competition. Amongst the occasion’s other festivities were txingaruten and harrijasoketa. The txingaruten was won by Mikhal Mrozowski from Poland, who carried the weights for five complete laps. This year’s Txitxiburduntzi was a great success, allowing guests from as far as away as Iceland a chance to experience a bit of the Basque culture and its traditions. May 9 – Txitxiburduntzi in Hartford, CT.
August 15 – Andra Mari in Mildford, CT.
October 24 – Sagardo Eguna in Middletown, RI. 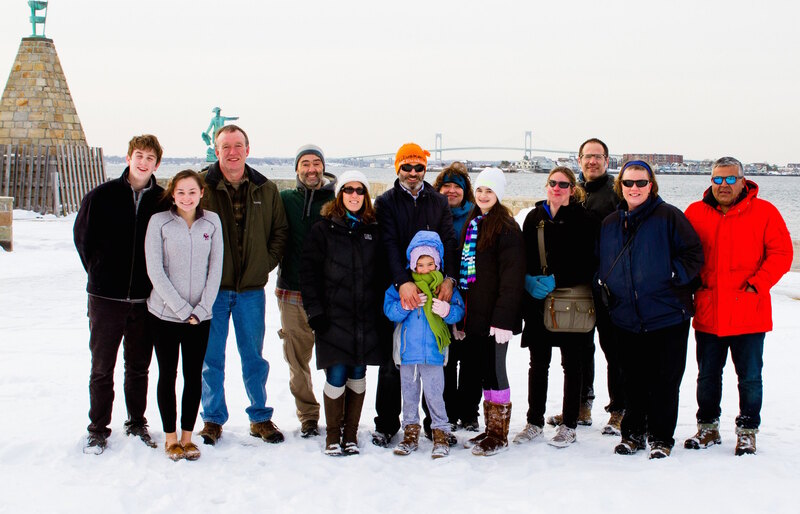 Members and friends of the New England Basque Club (NEBC) gathered last Saturday March 7th in Newport, Rhode Island, to join the spirit of the upcoming 19th edition of the Korrika. With a walk along King Park, attendees showed their support to the race in favor of Euskera that every year covers the Basque Country from one end to the other. Afterwards, a family dinner was hosted at a local restaurant. As a closing of the event, Marie Claire Resz, the eldest among the NEBC members, shared a commemorative poem she had written for the ocassion. In an ever changing world.